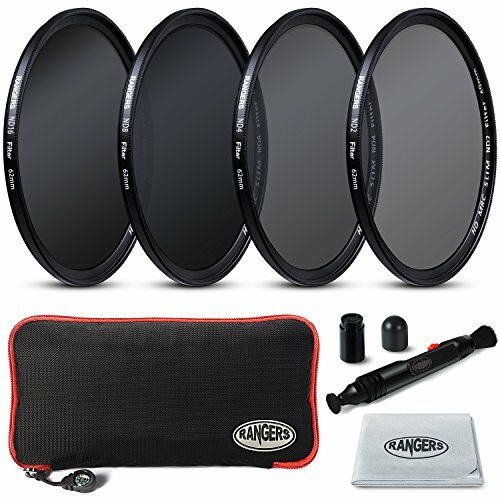 The Rangers polarized filters are great for long exposure shots and slower shutter speeds. This allows for wider apertures, decreased depth of field, reflection management, and suppressing glare from water. Can be kept on your camera at all times to protect your delicate lens from accidental damage. Separate subjects from the background by allowing wider apertures, effectively decreasing depth of field. One of the least expensive and most effective ways to dramatically improve your shots. Especially for beginner in photographing. Super compact size and light-weight design allow you carry it anywhere. Filter case: Durable high-density Nylon material with size 8.46" x 3.94"
• Please feel free to contact Rangers if there is any questions or problems with the kit. • Compatible with 62mm(diameter) camera lens. Compatible with all 62mm diameter lenses. Please verify your camera's lens thread size before ordering. Your camera's lens thread size will be marked somewhere on the lens barrel or printed underneath your lens cap. This number is always preceded by an "Ø" (diameter) symbol. For example: Ø = 49mm lens thread size. If you have any questions about this product by Rangers, contact us by completing and submitting the form below. If you are looking for a specif part number, please include it with your message.